I see that one of Bernie's babies has hit problems: the Valencia race may be ruled out, thanks to a protest lodged by the Spanish environmental group, Formula Verda. Regardless of the outcome of the objection, this may be enough to prevent the European GP being held on the proposed street circuit, the inevitable construction delays making completion unlikely before the race's given date, August 24 2008. There is some irony in the fact that Bernie has been caught out in this manner, the greenie pressure groups being a major factor in Max Mosley's plans for the future of F1. While Max runs around in circles, trying to make the sport acceptable to environmentalists, Bernie omits to pacify them before giving the new circuit the go-ahead. But we should not be too hard on them; environmental groups are notoriously impossible to please, their ranks being filled with the extremists who detest anything created by humans and woolly thinkers who imagine they can have their cake and eat it. It was only a matter of time before F1 ran up against serious problems in trying to keep them happy and preserve some semblance of motor sport as well. The Valencia thing is surely just the first of many such protests and the sport needs to decide now whether it is better to fight or flee. Max is obviously of the opinion that flight is best. Bowing to what he imagines is the irresistible force of the future, he tinkers around with the rules of the sport, apparently unaware that none of it will impress the greenies. The fact is that the green lobby will not be satisfied until F1 is wiped from the face of the earth and silly energy-saving measures such as those proposed by the FIA will be seen by environmentalists for what they are: sops to keep them quiet. It needs to be faced head on. F1 is a sport that is fundamentally at odds with the illusions and myths of the environmentalists - if it is to survive, it must fight them tooth and nail. Half-hearted measures will not achieve anything more than a breathing space; the greenies will always return demanding more. And it is not as if F1 is devoid of ammunition. Increasing numbers of respected and knowledgeable scientists are debunking the fallacies propagated by the greenies and warmies; every day there are fresh facts uncovered that make it clear that the global warming thing is a political scam and nothing more. The tide turns and public opinion turns with it, leaving Max high and dry with his illusions. The problem remains that, at present, the politicians have bought into the myth and there is a proliferation of environmental legislation that F1 must contend with. Valencia is an example, the EU having given permission for the greenies to proceed with their objection. It is quite likely that F1 will lose that fight, unless large sums of money are delivered under various tables. Bernie may have reason to thank his lucky stars that Max sees it as his job to hand out enormous fines to all and sundry. But the time to start fighting is now. The sooner the sport rejects the nonsense spread by those with vested interests in announcing global warming as a threat to mankind, the better its chances of winning support from the sensible people who make up the vast majority of the public. That is where the real battle lies, in the hearts and minds of the ordinary people. They have been fooled for a while into believing the global warming scam but that belief is leaking away, now that the lies of the warmies are being exploded. F1 must take advantage of that fact and lead in the campaign to get the facts known. This is not a global warming blog and I will say no more; it is only Max's warping of F1 in his quest to appear green that forces me to mention the issue. 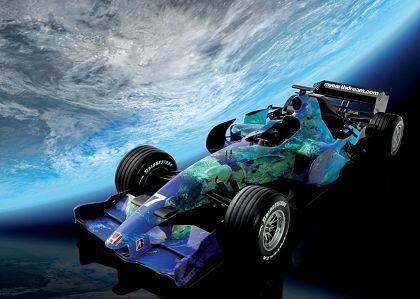 I have no doubt that many of you will be thinking me crazy to attack the global warming thing with such vehemence but I have to if I am to see F1 survive as something at least resembling the sport we love. You don't have to take my word for it - just keep an open mind and go read Andrea's global warming blog if you want to understand what is really going on. Clive, the "fresh facts" you see being uncovered are released to the press by the fossil fuel industry and those in their employ. When the US government and George Bush can sign up to the IPCC reports, you know its true, as thats the last thing they'd want to do. As someone who's read the science, and follows F1, it would help get the sport off on the right foot with the environmentalists if we, the F1 fans, were not seen as being global warming deniers - it only makes us a target. Haggis, there is more evidence to prove that the global warming scientists are paid by vested interests than there is for "deniers" being paid by anyone. In fact, "deniers" risk losing their livelihoods by standing up and pointing out the truth, so important is it to pressure groups that we buy into the scam. You say that the facts are released to the press but they aren't - the press continues to print the nonsense fed to them by the global warming believers. It is only the internet that allows reputable scientists to be heard when they point out facts showing that the whole thing is a myth. But I suppose we will all believe those we choose to believe and ignore everything else. Allow me just to point out again that there is nothing that F1 can do to get the environmentalists off its back - and giving in to them merely encourages them to demand more. What I find interesting is that hosting a GP is now so exorbitantly expensive that governments are now getting involved just to get the races off the ground. Having a race tied to government funding can only make it that much easier for environmental groups to lobby against it. Granted, many GP's are now held in countries where environmental issues are given little thought, but still. Perhaps Bernie might want to consider dropping that price tag a bit. I agree with your view on global warming. That climate change is happening is indisputable -- but the climate has been changing since year dot. What is in serious doubt is the extent to which man is effecting climate change. On this issue the science is, at best, uncertain and, at worst, a downright lie. Saying that I feel the popular opinion is turning more towards man made climate change as a real issue over the next 50 years. Publications, like the Economist, who used to be sceptical have become converts. Over the next five years I see the "green" movement gaining not losing momentum. Generally I think carbon emission trading and clean air policies are a good thing provided they are done properly. Economically it could even be beneficial if done correctly. That is the sensible view and one I have no argument with, John - of course we need to be careful how we use resources and ensure that we do not create more pollution than is absolutely necessary for the preservation of our society. That's just a matter of good housekeeping. But the green movement goes way beyond this, into fantasy worlds of doom and destruction, determined to convert us to their way of thinking through fear. The Valencia thing is probably not winnable by F1 on current terms in the long run. Valencia has long marketed itself as the most ecologically-sound city in Spain/Europe (its ambitions have grown over the years). When Bernie vetoes a perfectly serviceable race track on the outskirts of Valencia in favour of a city race, he should expect trouble. Even if Bernie gets his race, this could turn out to be an election-loser for the Valencia government and the next government would surely take a much harder-lined stance on F1 "to avoid making the mistakes of the previous government". That said, this is mostly the Valencia government's fault for not following its own procedures correctly. Quite frankly, on this occasion, I believe the greenies have a point, for they are actually complaining about houses being affected by the river, whose course is changing as a result of unintended consequences of construction work. The wider "global warming" issue is only peripherally involved (though Formula Verda is pretty annoyed on that front as well). There used to be a rule that a circuit could not be awarded a GP until it had successfully hosted an international race of a more junior category. I never understood why that rule was dropped. Time to bring it back. Yes, I remember that rule, Steven, and I'm not quite sure when it disappeared. All that seems to matter these days is that the organisers can come up with the price. I am currently conducting a dissertation on f1, i need 100 f1 fans to fill out a questionnaire which will take no longer then 5-10mins.